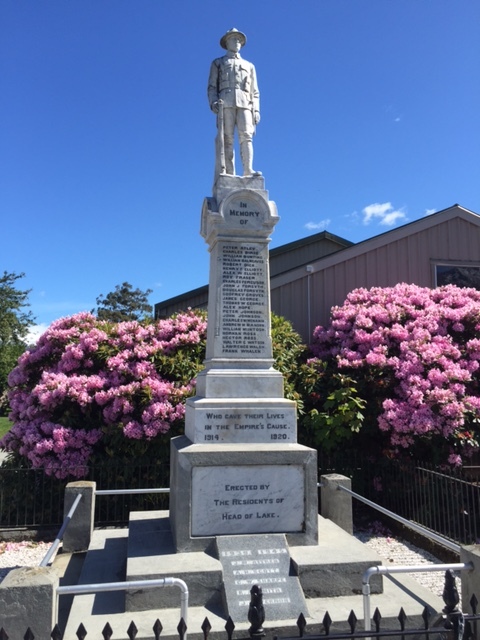 About 45 minutes from Queenstown is the small township of Glenorchy, I’ll have another post coming up in the next few days about the town but in the meantime, I wanted to quickly share a little about the War Memorial and the impact of both world wars on this small town. Click on this link to see the location on a map. Although the town is tiny, there is a disproportionate number of men who served during World War 1 compared to the local population. This was because at the time, there were a lot of extra men in town working in the local mines. 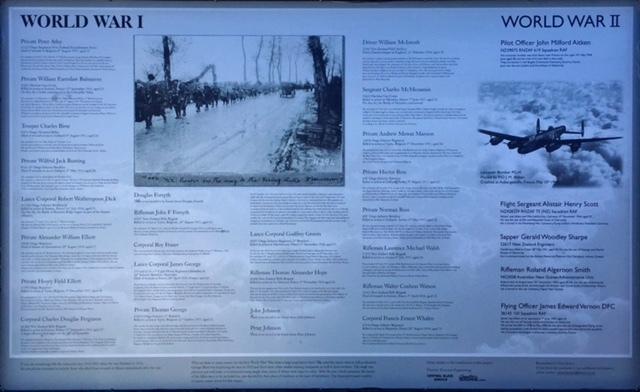 Many of the men who served and had their names on the memorial, actually came from other parts of New Zealand, and their families were living in other areas. Also interestingly, the dates on the memorial are from 1914-1920, which was to include those who later died from injuries sustained during service. 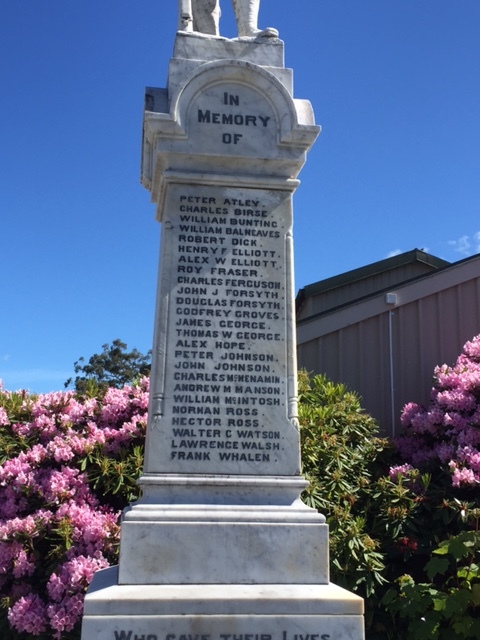 The original memorial was unveiled in 1924 and then following WW2, the additional names were added for the men who died serving from Glenorchy during that war. By the time World War 2 arrived, the population in the town was back to its normal numbers, so the loss of life was 5 men instead of the staggering 25 from WW1. There was a large placard next to the memorial with details of the men with their names on the memorial. Who they were, where they served, their families and their place of internment. I wish more war memorials would do this to further remember those individuals, they are more than just names. I’ve often been intrigued by our war memorials here in NZ. Our Boer War memorials commemmorated all who went, whereas our WW1 memorials only commemmorated the dead – and not necessarily all of them. As you point out, many died after returning here (lingering wounds, effects of gas, etc) – of which not all were captured by army record. Weirdly, we also memorialised our wars in the form of public buildings, typically hospitals, women’s rest rooms, libraries and meeting halls – a curious and unique form of memorial that NZ seems to have been virtually alone in doing. And yet it took us nearly 90 years to get our “Unknown Warrior”! We have a war memorial library here in Christchurch, I need to go and visit as I know that some of the names on the marble plaque inside are likely my Gran’s cousins. I guess with the massive number of those that served after the Boer War, it was too many to include everyone that served. 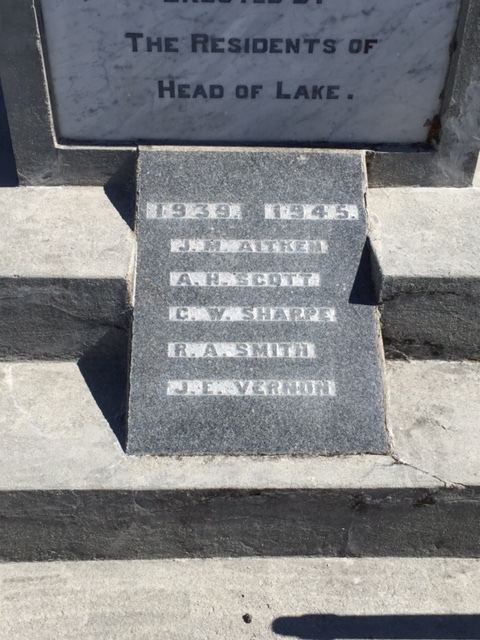 I know a friend was recently pleased that the new memorial in Christchurch now includes a relative that up until that point wasn’t named anywhere as he had no immediate family.